Japanese writers like Osamu Dazai, Akiko Yosano, Bokusui Wakayama…etc were fascinated by the nature and the hot spring of Minakami. Perhaps being surrounded by nature is one of the reasons that inspired some their masterpieces. Minakami is famous for outdoor activities but it is also a place of artistic demeanor. Leave chaotic city life behind, have a slow day in Minakami. Perhaps because Minakami is surrounded by mountains and forests with the superior water quality, also the fact that it is a famous hot spring town; the movie “Thermae Romae II” was filmed here. One of the set of the film were shot in a hot spring that has 140 years of history and had been registrated as Tangible Cultural Property (Japan). Departing from Tokyo in morning, you will arrive by noon. Breathe in the fresh and clear air while you relax in the hot spring. Take a relaxing bath of sulfate spring in a wooden building structure with 100 years of history. Not only does it have practical effect on the body, it also has the ability to cure the busy and hectic mindset of city life. After you leave Hoshi Onsen, do have lunch at Horakukan which is located in the tourist information center of Takuminosato (The village of artisan). Apart from all kinds of noodles menu and the Maitake rice, the Garrett baked by 100% Soba flour is also an excellent choice. The yogurt is made with fresh local milk rich as cheese but low in calories. It is a great drink for both kids and adults. Takuminosato (The village of artisan) used to be one of the “Shukuba machi” in Japan. Shukuba is a rest area during the Edo period in Japan. These rest areas were places where travelers could rest during their journey across the country. There used to be a lot of Ryokan (Hotels/Inns) in Takuminosato, but due to the development of transportation and automobile, accommodation services had significantly decreased. At last, only the Museums or craft workshops were able to sustain. The various crafts experiences that are available in the village include pottery, washi paper (Japanese paper) making, glass making…etc, you can also make your own konjak and soba noodles. It will take at least half a day to visit Takuminosato on foot. However, you can rent a bicycle here, to make your visit smoother and much more relaxing. Shippo-yaki, a metal crafting technique that grills multi-colored glassy glaze onto a metal surface. In English, this is called cloisonne enamel, but in Japanese it is known as "Shippo". "Shippo" means "Seven Treasures" and the word originates from the Buddhist Sutra describing the beauty of seven kinds of treasure being spread onto the land.By using different materials and techniques, it will show different qualities and characteristics. You can choose the shape of the metal surface, color and technique. The instructor says “The forecast experience is one hour long, and the production time actually only takes 20 minutes, the rest of the hour is the participant being hesitant on what to do”. Well, it is due to the fact that the colors are so charming that participant do know what to choose. After you select the color and style, the metal is then glazed for the instructor to vaporize for further process. Then you can create your own design and decorate the metal to be glazed and grilled again. When the work comes out from the kiln, it will be burning red and after cooling it will turn black. After this process it will gradually turn into the chosen color. To understand the magical charm of cloisonne techniques, you really need to feel it with your hands and see it with your eyes. Traveling comes with different encounters. The end of the trip, leave your smile here, and bring your beautiful precious works and memories back to city. 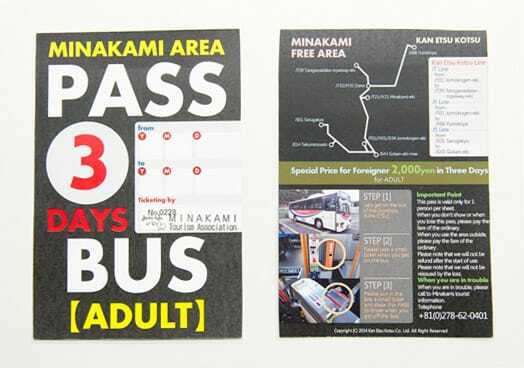 3DAYS BUS PASS You can buy a 3Days Bus Pass in Minakami Tourism Association (Near Jomo-Kogen Station) or The Association of Minakami Onsen Ryokan (Near Minakami Station) for JPY 2,000. This bus pass is highly recommended even for a day trip. Furthermore, you might want to consider combining Authentic Journey courses together in this website, 3 days of relaxing time and exploration in Minakami! ※Tourists only, passport required.